You know you’ve arrived when someone makes a T-shirt celebrating your achievements. 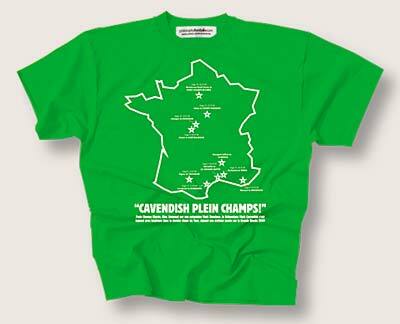 A clothing company has just released a green T-shirt depicting a map of France showing the location of all ten of Mark Cavendish’s 2008-09 Tour de France stage wins. The company, www.philosophyfootball.com, are more used to making shirts celebrating footballers so it’s an endorsement of cycling’s rise in prominence that they are making a shirt dedicated to Cavendish. The company’s co-founder Hugh Tisdale is apparently a fan of the Tour and witnessed Cavendish in action at this year’s race. The shirt also includes a quote from French sporting paper L’Equipe, and has the legend ‘Cavendish 10’ on the back. The shirt is available in five sizes from small to XXL and is priced at £20.99 from www.philosophyfootball.com.